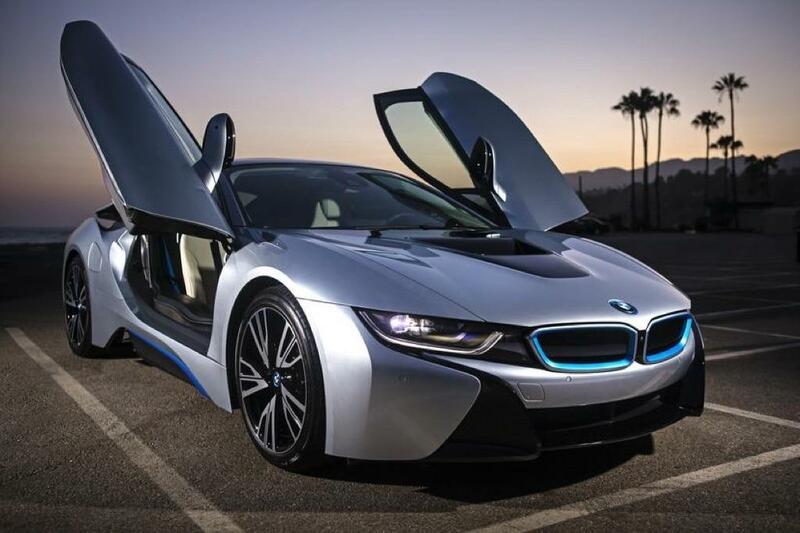 Is The BMW i8 Still The Car Of The Future? It was heralded as the future, a step into the 23rd century. Few automakers cave to such levels of creation, mostly for fear of failure. What BMW did with the i8 was nothing short of a colossal gamble, filling the long-vacated flagship spot in its arsenal—a space once occupied by the venerable M1—with a hybrid vehicle sporting a 1.5-liter engine with just three cylinders. It was hardly a recipe for excellence; at least, that’s what we’d been led to believe. But during the Geneva and Frankfurt auto shows in 2013, our vision of the future shifted. Along with the i8 came the production-ready versions of the Porsche 918 Spyder, the McLaren P1, and the Ferrari LaFerrari. That trio of hypercars boasted Formula One-style KERS systems—or, in the case of the Porsche, two electric motors cleverly synced with a burly V-8. All cars featured carbon fiber cockpits and a combined horsepower figure in excess of 887. The cheapest of the bunch fetched $845,000, and all were to be sold in very limited numbers. And yet there was the i8, its butterfly-style doors gleaming in ice white; its skin appearing borrowed from William Gibson’s imagination. The combined 357 horsepower and 420 lb.-ft. of torque weren’t the headline attraction. How that power was made, however—and its attainability—very much were. The front wheels are powered by a 129 horsepower electric motor. In relaxed, everyday driving environments, the i8 is mostly a front-wheel-drive EV with the acceleration of a Chevy Volt. A heavily turbocharged 1.5-liter lifted from a Mini adds an additional 228 ponies—used only when charge is low, a sudden acceleration is required, or you place the car in “Sport” mode—and like the hypercar trio, a carbon fiber tub keeps weight to just 3,455 lbs., light given the additional mass of the electric motor and its corresponding batteries (around 400 lbs. trimmer than a Nissan GT-R). This ensures 60 mph arrives in 4.4 seconds, and the electric motor alone provides around 15 miles or so of zero emissions driving. That’s not hypercar fast, and the electric-only portion lacks the range of a Volt or a Toyota Prius PHV. What’s important here, though, is the price: $136,000—for a car that looks as if it belongs to Batman. Like in the million-dollar McLaren P1, the immediate torque available—thanks to the i8’s electric motor filling the delay in acceleration while the turbo spools up—delivers a whole new driving experience, one where a graze of the gas pedal unleashes a savagery most enthusiasts won’t have felt. Even in the modestly-powered BMW, the way it bursts out of turns remains impressive, its skinnier tires allowing the car’s full potential to be realized on everyday roads. 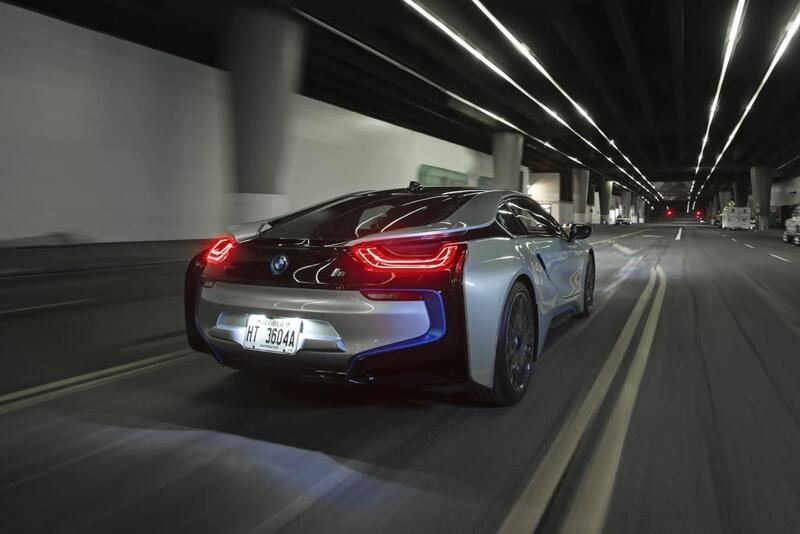 Unlike its higher-priced compatriots, the i8 is designed for somewhat mass-market consumption. It arrives cheaper than many Porsche 911s, or Mercedes-AMG GTs, or Audi R8s. A fully-loaded Corvette Z06 can be built using Chevy’s website for $123,842, and while the ‘Vette will be faster (speed isn’t the i8’s goal), in the Bimmer, you’re offered the future: Carbon fiber construction, something rarely adopted for those lacking pockets the size of Trump’s head. Hybrid technology that delivers zero emissions driving. That same tech used as an actual advantage when it comes to performance. What you see here is the template that will form the next generation of sports cars. But unlike the future as it’s being told in the million-dollar hypercar club, with a promise that its technology will one day trickle down to vehicles you might actually be able to own, with the i8, that future is already upon us. 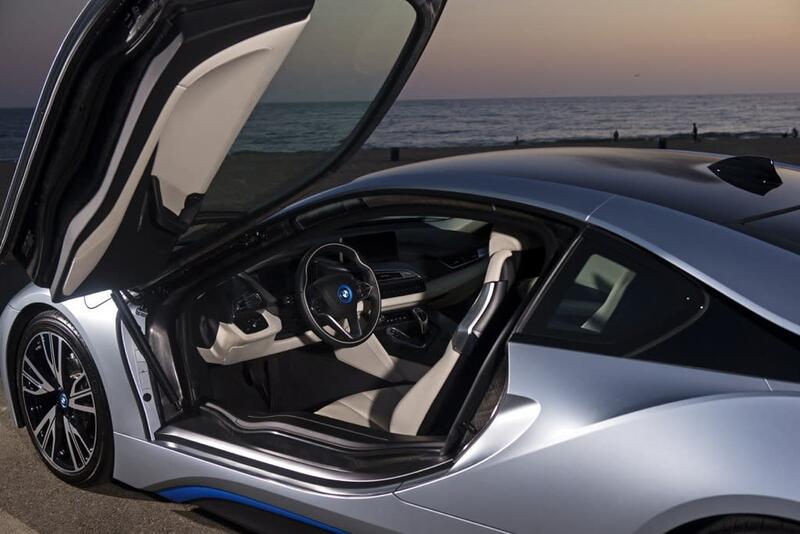 The i8 was an experiment; this year to date we’ve seen 1,609 units sold. Compared to the widely panned Cadillac ELR’s 889, that seems like a solid figure for an expensive machine. But the i8 really isn’t about sales. We first reviewed the car back in April 2014, where we too joined most every publication on the planet in declaring it a revelation, an experiment that was already a success before even arriving at dealerships. Sure, its all-electric range could be higher, as could its total horsepower. But for the price—and for a first attempt—there was nothing like it on the market, an alien spaceship found in a few stray cornfields, foretelling the invasion that’s soon to occur. And yet almost two years on, that invasion hasn’t happened. The Alfa Romeo 4C has a carbon fiber tub, but it lacks much of anything else. The new Acura NSX features hybrid technology like the i8, but it arrives for $40,000 more and forgoes the costly carbon construction. Hybrid GT-Rs and 911s are rumored, but to date, BMW’s flagship sits in a sci-fi looking parking lot all by itself. 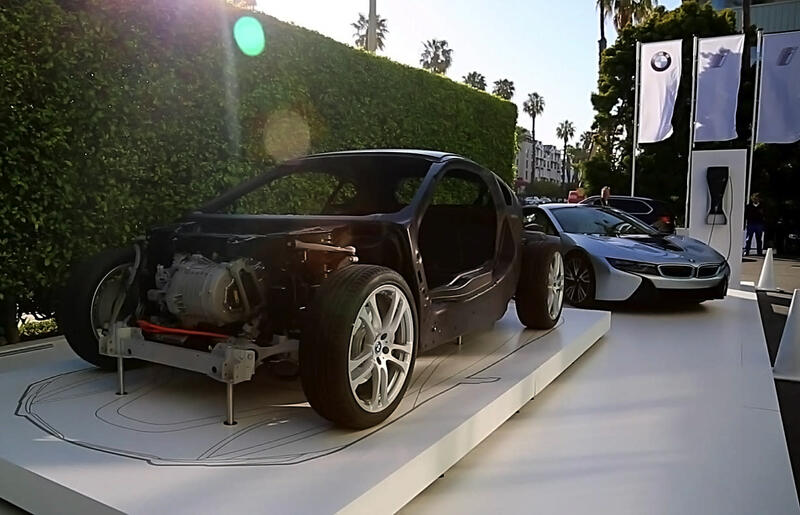 The i8, then, is leagues ahead of its competition; while a Tesla Model S P90D is considerably faster, it weighs about 18 million tons and lacks any real cornering proficiency, thus placing itself in an entirely different segment. But like that car, the two have unquestionably ventured into new territories. Maybe a better question is: How long will it take for other automakers to finally catch up?